Tsukuda Hobby made their first real venture into wargaming in 1981 when the company acquired the license for Mobile Suit Gundam. 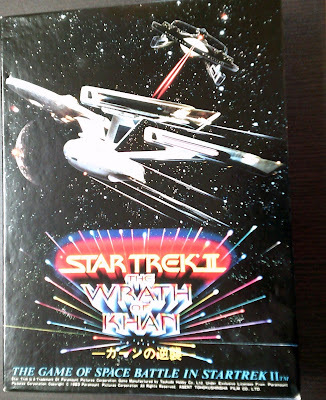 At the time, the animated space opera was a huge hit in Japan. And no wonder! It's about huge freakin' robots fighting each other in space. How could you go wrong with a premise like that?! The success of the first two Gundam-based wargames, Jabro (which dealt with ground combat) and Fortress (which focused on space battles) spurred the company to venture further into their existing licenses and make games that dealt with other topics. Star Wars: Death Star and Star Trek: The Invasion of the Klingon Empire were published in 1982. I'm not sure if any of these games were good or not but they were successful enough to spur Tsukuda to keep releasing similar gaming products throughout the 1980s.